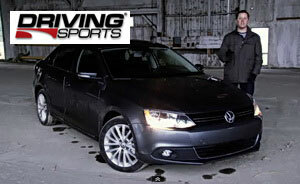 Aaron and Ryan take a look at the new 2011 Volkswagen Jetta SEL. Volkswagen made it clear that the targets are once again the strong-selling Civic and Corolla. To entice folks considering those cars to also look at the Jetta, VW has lowered the model’s price, introduced a 115-hp base version, reduced the complexity of the options and trim levels, and grown it even further. To reach a lower model price, the 2011 Jetta has had to make some concessions. One very obvious compromise can be seen its dashboard material. Whereas the previous car had soft-touch, nicely grained plastics that were comparable to those of the Mercedes-Benz E-class, the new model has hard plastic that wouldn’t look too out of place in a Chrysler Sebring. All models besides the top-spec GLI return to a torsion-beam solid rear axle, and the bottom two trim levels (S and SE) have rear drum brakes instead of discs. And those are only a couple examples of the changes made to make the Jetta a more affordable car. Watch the video and find out if the cost-saving measures really cheapens the new 2011 VW Jetta. Driving Sports is a registered trademark of MediaSpigot LCC. Content is copyright 2003-2011 Driving Sports. All rights reserved.